Four complementary shades can be swept across eyes, cheeks and lips to contour and highlight for a luxurious look that’s made in the shade! Take it easy this season with jane iredale’s bronzer quads that each slip into Jane Iredale's sleek, refillable compact - and give yourself a radiant look without the rays! The new-look striped bronzers have been re-designed to be more shatter-resistant and stable. Each bronzer contains four luxurious shades that can be mixed and matched to suit every mood. None of these shades contain wheat. 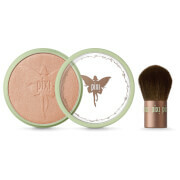 Moonglow Golden Bronzer Refill and Sunbeam Bronzer Refill are vegan. 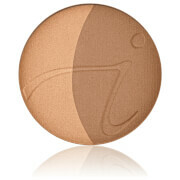 Rose Dawn Bronzer Refill: Vegans will want to avoid this shade (this shade contains carmine).